This post originally appeared on Glance Networks’ blog in July, 2015. I don’t think I’m going out on on too much of a limb when I say that everyone wants to help customers achieve their goals. We want to be customer-centric. It makes us feel good when a customer thanks us for our efforts. So when you’re working in a company that isn’t as customer-centric as you are, it’s disheartening to say the least. In fact, it can be downright demotivating. I once worked for a company that put short term profit ahead of a long term customer relationship. There was constant pressure to bring new customers in the front door because existing customers were streaming out the back! We know that 70% of US workers are disengaged and I’m sure the figure wouldn’t be too different in Australia. Part of the reason for that, I think, is this misalignment in customer centricity between employees and employers. After working for the company I referenced above, I quickly came to the realisation that as an employee, I would be most engaged working for an organisation that was as customer-centric as I was. From there, I came up with the following list of attributes to look for in any prospective employer. Essentially, I agree with him. At the same time, to be truly motivated I need to know that I’m working towards a goal that’s higher than just creating customers. I need to know that through the company I work for, I am delivering to a greater benefit to society. The key questions to ask yourself are: Is the vision statement authentic? And is it believable? Simon Sinek said, “People don’t buy what you do, they buy why you do it.” (I highly recommend watching that video – it was a game changer for me.) Whatever a company’s higher purpose may be, I like to see it communicated far and wide so that customers and employees alike know exactly why the organisation exists. Wikipedia defines transparency as implying “openness, communication, and accountability.” As customers, we value transparency. As employees, it’s exactly the same. Transparency builds trust and trust is critical to engagement. – How accessible is management (for both customers and employees)? – How is information shared throughout the company? – How does management communicate with staff? – How often does management communicate with staff? – Is it a two-way dialogue? – Is it clear what the overall goal of the company is and the part that all employees play in achieving that goal? – Are all employees made aware of their accountability to the company’s major shareholder: its customers? – How customer centric are the company’s job descriptions? Does everyone know how they impact the customer experience? Being empowered means being given the right tools to do my job and having the authority to make decisions for the things I’m accountable for. Without these things, I’m simply not going to be effective. Companies committed to employee empowerment also “provide more information in greater detail than the average company” which goes to my previous point about transparency. This may seem obvious, but for a company to be customer-centric, it must understand its customers. The company should know its customers’ goals, journeys, perceptions, and preferences. – regularly seeks employee feedback. If the answer to all these questions is “yes,” the company is well on its way to being a good match. 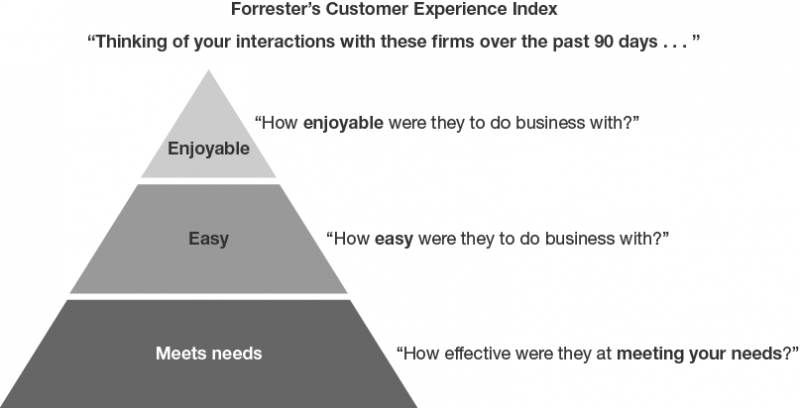 In the book Outside In, Harley Manning and Kerry Bodine of Forrester Research proposed the Customer Experience Pyramid. The first level of customer experience (what I call “CX hygiene”) is that your product is useful. To know whether a product is useful or not, a company must first know what its customers’ goals are (which goes to Point 4). If a company is making a product which doesn’t satisfy customer needs, the effort to sell that product is going to be magnified. I’m going to seriously struggle to be engaged and frankly, I’d have serious doubts about the long term viability of the business. As you can see, being customer-centric is key to everything in business. It’s what makes an organization viable not only from the customer point of view, but from the employee point of view as well. How attractive is your company to work for and what changes can you make today to improve that?